Professional ultra silent single stage motor (high effciency). Paper and cartridge filter. Integrated accessory holder. Shock proof metal design and traceless wheels. 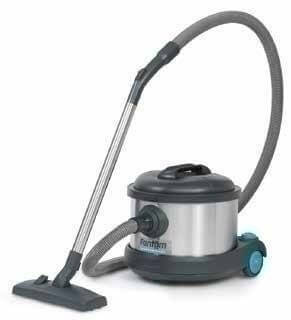 The ever-popular ProMini 100 is a canister vacuum cleaner designed for solid performance in abusive environments. Its tremendous suction power and durable construction make it a reliable choice for demanding applications, such as mold or asbestos remediation. A superior filtration system, ensures a safer work environment. HEPA-Filtered Vacuum with 1000 Watt Motor Includes: 6' Hose Assembly with Bent Wand, Telescopic Wand, Combination Floor Nozzle, Crevice Tool, Combination Round Dust Brush/Upholstery Tool, and one paper bag.